You can use the glossy channel buttons to browse categories or the links at the left to filter on latest or type. 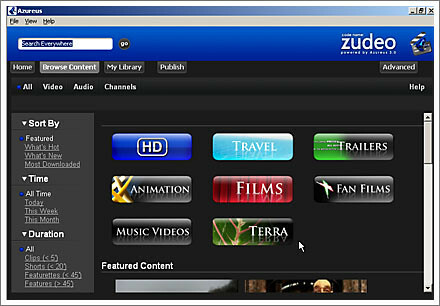 The downloads available here on the ‘Zuedo Portal’ are generally trailers, demo clips, shorts, with the occasional longer movie. If you see a clip that looks interesting hold the cursor over it and you will see some details like file size and clip duration. Click the details button for more in-depth information. The number beside the Thumb up or Down is the clips rating. The number beside the down arrow is the number of times this clip has been downloaded. If the clip looks interesting simply click the Download link to add it to your download queue. You should see a “Downloading Torrent File” progress window flash up briefly while the torrent file proper is downloaded to your computer. Azureus will automatically open the torrent file and try to add the contents to your download queue. You’ll see pop-up and you’ll want to click the Don’t prompt again check box then OK. The second pop-up Information window is configured to pop-up each time a file is queued, and will auto hide in a few seconds. Awesome. First download is on it’s way. Blue areas are pieces that have been completed and are now available for you to share with others. So to go back to your download time, it depends on how many people have the pieces you need, and how fast they are willing to share them with you, in addition to any personal bandwith or network limitations you might have. Generally if a file is being shared by lots of people you will download it very quickly. 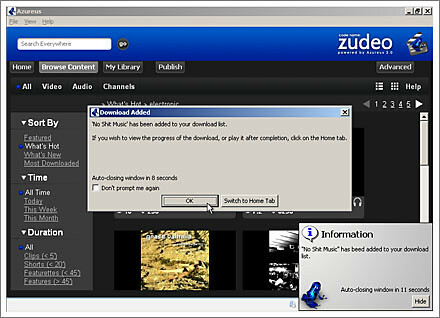 Files that you download from the Zuedo interface should come fast. Files that are being shared by a handful of people on and off could take weeks. Here you can see that in the time it took me to write this my download has completed. Simply click it to run the file. For me it’ll play the mp3 – for you it might open a video clip in your favorite player. Don’t forget that while Azureus is running you can be uploading as well as downloading – so unless you have unlimited bandwidth don’t forget to check your ISP’s usage meter regularly. If you have nothing downloading or are approaching your limit for the month, make sure you close Azureus. Make sure it hasn’t just minimised to the Task Tray where the clock sits. 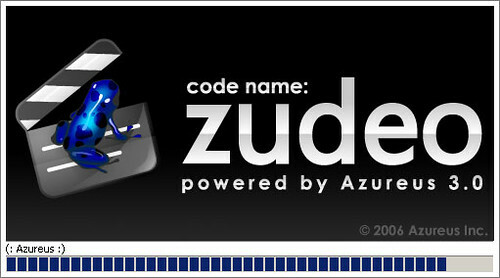 If the Azure Frog is there right click it and Exit. That is about all for this installment. Next I’ll show you how to find nearly anything you want and download it, as well as tweak your settings to get some more out of Azureus.